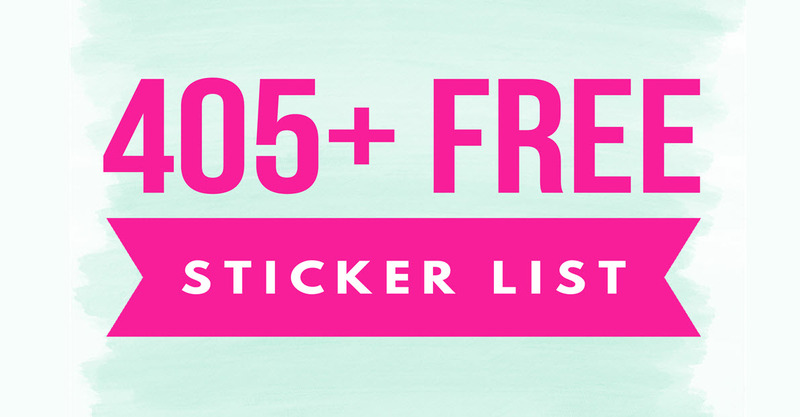 Home » FREEBIES » 405 TOTALLY FREE Stickers By Mail LIST! After months of work my FREE Stickers list is finally DONE! I hope you enjoy this list as much as I enjoyed creating it! Disclaimer : I DO NOT GIVE OUT THE Free Stickers. This is a LIST of free stickers that other companies give out. Before you get started with this FREE Sticker list there are a few things to tell you. First off IF YOU LIKE THIS LIST Comment below, tell your friends and share it EVERYWHERE! Next, free Sticker freebies, just like everything else online will expire at some point. If you notice a link is not working please let know by commenting. Next, there are 3 different types of sign up in this free sticker list. The first way is straight forward. Just Click on the link and follow the direction on page to get your free stickers. Most just ask for your email and mailing address. After that you will find companies that give out free stickers but you have to fill out their contact form and ask them to send you a Free Sticker. Below that you will find email addresses of companies that give out free stickers. All you have to do is email them and ask to send you one! That’s it! If you want to find other FREEBIES besides free stickers [ GO HERE ]. If you want to sign up to get FREE Samples directly to your inbox [ GO HERE ] ! NOW, LETS GET STARTED Getting Free Stickers!! The Lucky Knot Sticker – send an email to STICKERS@THELUCKYKNOT.COM with your name and mailing address. Did you enjoy my Huge free stickers list? Like I said this free sticker list too me forever to create. PLEASE Tell all your friends about it! Also, be sure to sign up below to hear about even MORE 100% – Legit Freebies in the mail! Instant WIN an Amazon Kindle Oasis E-reader! Insane ODD! Worth $249.99 ! I love this list! I will share it everywhere! Thank you I shared on Facebook and pinned to Pinterest. I love your finds. Thank you so much! I really love your list! I will be sharing! Thank you for all of your hard work compiling an awesome list. I have already shared with my friends. Thank u! Ur awesome!! Love the list! !